Neither side created a clear-cut chance until Sevilla defender Simon Kjaer's mistimed header from Sarabia's cross flew well wide following a set piece in the 21st minute. Sevilla, who made four changes from the starting line-up in Saturday's 2-0 defeat at Real Madrid, wanted a penalty four minutes later. Ben Yedder was next to threaten for the home side, but his shot after a fine solo run curled wide, while Malcom spurned Barca's best chance of the half. 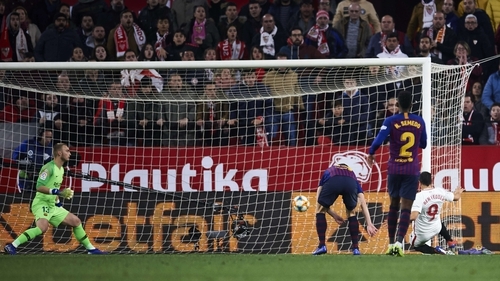 Sevilla were denied the breakthrough shortly before half-time when Jasper Cillessen raced off his goalline to block Ben Yedder's effort. Andre Silva prompted a swift counter-attack and when Ever Banega's shot was deflected into Ben Yedder's path, the striker tapped calmly home.